Our Signature Endless is now Reversible and available in a super soft and cozy luxe Bamboo Jersey. We couldn't resist trying this Canadiana inspired print in a heavier Bamboo Rayon perfect for the cooler weather. A timeless multi-way design with our elegant hand rolled quality finished hem. Now available in one of our Limited Edition prints for a short time. This unique travel accessory is designed to have many options and take up little space in your travel bag. It's style options are a poncho, wrap, scarf, skirt, dress, halter top, one shoulder top and more. Double your looks when your reverse the print to solid Red. Never travel without an Endless, if your luggage goes missing - you know you're covered. Accentuate your waist and create a new style by adding a Scalloped Sash! Our Bamboo Jersey is designed to be soft, cozy, beautiful, and comfortable to wear! It's perfect for travel as it's incredibly versatile. It's 95% Bamboo Rayon and 5% Spandex with the perfect cool weather weight of 7.5 oz and has a luxe quality feel. This fabric can be worn at the cottage or chalet as it's casual yet elegant but can also be dressy enough on the reverse side for a night out or a day at the office. It drapes beautifully and has a matte soft finish like the softest bamboo giving it a luxe understated look. Washing Instructions: Diane Kroe's goal is to make your life easier by using fabrics that are beautiful yet stress-free. Simply place your garment in a mesh laundry bag and into your washing machine on the delicate cycle in cold water or hand wash in cold water. After washing, lay flat to dry or tumble-dry on low-delicate (mesh bag recommended). Do not bleach. Your pieces will remain as good as new for a long time. Our quality and workmanship are designed to last. 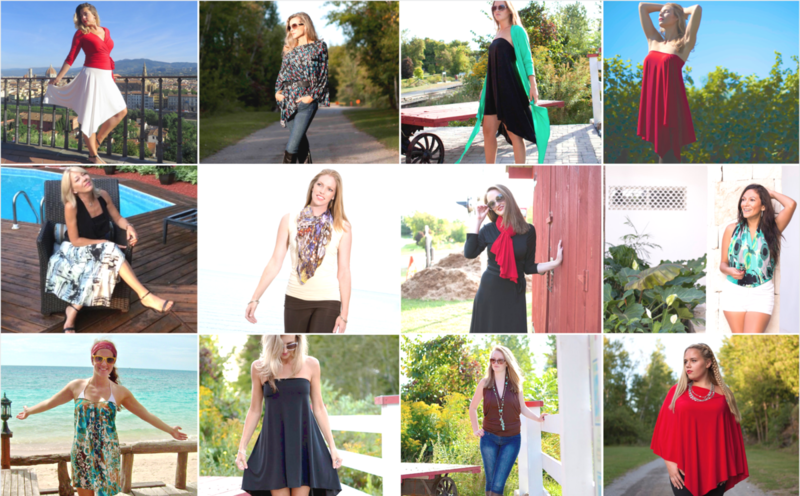 All Diane Kroe designs are proudly and ethically made in Toronto Canada. Read Travel Fashion Girl's Review of the Endless Here! A modern-day update of the multifunctional scarf that now doubles up as a peaked hem skirt. Simply bring the opening to your waist and position seam off to one side. A luxurious scarf is a wardrobe essential that you can wear in the moment—and keep forever. To get this look wrap around your neck and pull fabric through the opening. For beachside layer over a swimsuit or add stilettos and you have a strapless cocktail dress. It's easy!! Bring the opening over your bust and position the seam in the centre. There’s something unapologetically romantic about this silky strapless tunic for an evening out. Simply add a Scalloped Sash for a dressy detail. Simplicity at its best with this one shoulder look for any and every elegant event. Pull one arm through the opening and wear the seam to the side. Pull both arms through the opening and you have a classic poncho. An elevated version of a simple halter design. Place your head through the opening making sure the seam is running down the front then tie a knot in the back. The Endless is chic, timeless and versatile. Unique to the Diane Kroe brand since 2008. It's our special finish, talented sewers and unique thread, that make this design even possible without ever stretching out or ripping when achieving each look. Made-to-order just for you in Toronto Canada.